I am a complete f***wit. We'd set the alarm. We'd laid out Item's t-shirt, bib and shorts. We'd figured out what time we needed to leave the house to get her to the start point on time. And we left the house ahead of ourselves, rationalising that it'd be good to get there early and see the set-up. So everything was fine, until we got to the bus stop and realised there were NO SODDING BUSES RUNNING. And the worst of it is, in the back of my mind, I reckon I knew this. I'm sure it was last year that I was trying to get across town to pick up a portrait of myself, worried about being late because there were no buses. And I'm sure I'd seen some posters on buses in the last couple of weeks, but vaguely thought, oh it won't affect us surely - we'll be setting off way before the marathon affects the centre of town. Not that the bus company was any help at all today. When we reached the stop, there were four or five people waiting. The electronic sign was blank - not an unusual occurence and not necessarily a sign that the buses weren't running - in fact, they normally put a scrolling message at the foot of the sign to warn of any delays, etc. Across the road, a bus was parked, pointing in the other direction. When I ASKED, the driver, who had been standing in the street looking across at us, told us we would be waiting all day if we were hoping that a bus would arrive. Would he have bothered to tell us otherwise? We had a 1.5-mile walk ahead of us - to get to the spot where Item was supposed to run a mile - and 40 minutes to do it in. I have never felt like such a poor parent. After a night of anxiety dreams, it felt like I hadn't actually woken up. I was alternately apologising gravely to Item, and asking her if it was a dream. "No, because I'm here as well," said possibly-dream-Ites. On the way down St James' Street, I'd tried a cashpoint which wouldn't take my card, then found a second, only to find that the woman in front of us was feeding in one card after another to get a balance on each. Finally we found one and got out enough cash for a cab. But was there any point in ordering one? By the time it came, and navigated through the blocked streets, we'd be better walking. East Street, where the taxi rank would ordinarily have been, was completely fenced in. At Churchill Square, there was a bus waiting at the stop. We ran for it. The bus pulled away. We tapped on the door... the driver let us in. Thank god! We rode a few stops, got off at Waitrose and hurried down Waterloo street to the Peace statue, me checking the time obsessively. We made it. Thank god. The races were in age bands, at five-minute intervals, and the two batches prior to pink were warming up when we arrived. At this point, I bumped into a woman from my NCT group, whose daughter Hannah was born at the same time as Ites - she was running too. We had time for a quick chat, and then the pinks were ushered into a pen for a warm-up, led by an ebullient yoga teacher, that had them dancing to a selection of music, culminating in Gagnam Style. I lost sight of Item, then saw her, throwing herself in to the warm-up; then they corralled the pinks into the starting pen and I couldn't see her at all. I got a head start on jogging towards the finish line, on the lower prom, since the race itself was on the upper road and lined with spectators. Half way along, I heard cheers and could tell that the race had caught up with me, so I mounted the steps to the upper prom. Again, I couldn't see Item at all. I waited 'til the very last walking stragglers had passed, then took off again. I often avoid this stretch of pavement on sunny days, because I know there'll be pedestrians everywhere, but that's nothing compared to the people, pushchairs and bikes I had to weave around today. At the finish line there was a heaving scrum. I could see The Boy, but he couldn't see me, and didn't hear his phone. In the end, continuous loud, unladylike shouts got his attention. He'd found Item. 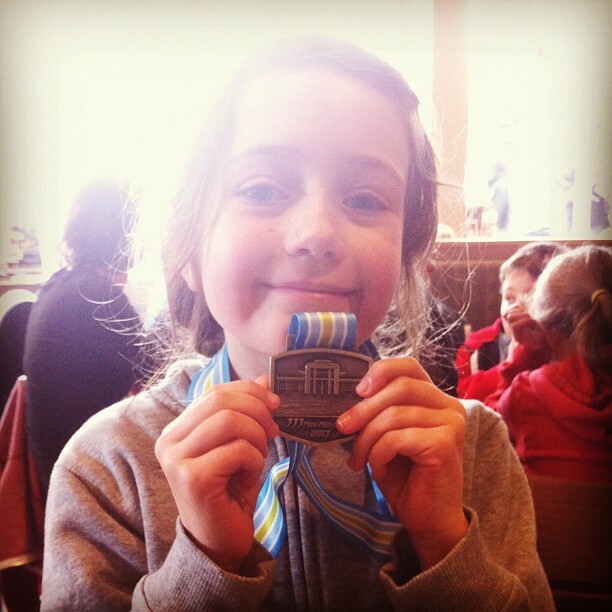 She'd run the mile and she had her medal (the same stretch of road would be the final mile for the proper marathoners). I am SO ridiculously proud. One nice thing about the medals is that they are almost the same as the 'real' marathoners' ones - they have the same picture of the West Pier, and the same ribbon, and are metal. By the time we'd found the crossing point on Marine Parade, the marathon proper was running up St James' St, our route home. We ducked into a coffee shop and watched the tired runners, relatively early in the course route (about mile 5). They were tackling the sort of hill that you don't give a moment's thought to when walking, but which becomes painful for runners. Some of them already looked well-knackered. It was only about 10:30 by the time we got home. That was rather a lot of effort for so early on a Sunday, with rather more worrisome elements than I usually prefer to encounter before I'm properly awake - but Item is already resolute that she wants to enter again next year. When we will make better travel arrangements.